According to the US Travel Association, Americans took 1.7 billion person-trips for leisure purposes in 2015. Add to it the 459 million person-trips for business and you have about 2.2 billion person-trips per year being taken annually by US residents. And, if 10% of women and 25% of men suffer from obstructive sleep apnea (OSA), we can deduce that, on the low end, 220m (10%) of those person-trips are associated with sleep apnea and, on the high end, 550m (25%) of those person-trips are associated with sleep apnea. We can't assume that 1 person-trip equals one person because many people take more than one trip per year. But, you get the point, though. There are millions of men and women suffering from OSA that travel each year. Some treatment options for OSA include a CPAP machine, oral appliance therapy, weight management, positional therapy (a strategy to address an OSA patient's behavior while sleeping, i.e., customizing a device to force sleeping on one's side instead of in the supine position where the OSA typically occurs), and surgery. For those that use and wear a CPAP at night, traveling with it can be inconvenient and cumbersome. Some OSA sufferers take the chance and don't bring the CPAP along. Others will bring it along fully aware of the risks they are taking if they don't. The good news for each is that there are portable and less cumbersome alternatives. Portable CPAP Machine - The travel CPAP machine is as you might imagine. It's a more convenient and less cumbersome version of the weighty CPAP machine that OSA sufferers have at home that is portable enough to carry on the road. These machines are less bulky because they don't include the humidifier. They are, however, still able to track and record sleep data. Oral Appliance - An alternative to the portable CPAP-to-go device is an oral appliance that fits like a mouth guard and positions the jaw forward to keep the upper airway open. 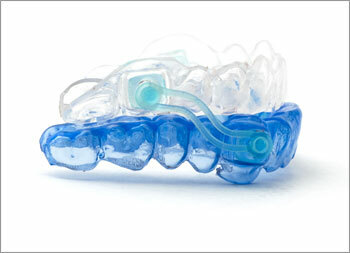 An oral appliance is not a piece of machinery nor does it come packaged with a mask or wires. If prescribed by your sleep specialist, you would visit your dentist to have the mold made. Nasal Valve Therapy - An additional option for OSA sufferers where a valve is attached over the nostrils using hypoallergenic adhesive tape. The nasal valve opens and closes as the OSA patient breathes whereby air is redirected back into the throat to keep the upper airway open. These devices have been approved by the Food and Drug Administration (FDA) but require a prescription from your sleep specialist and are not covered by insurance. If you've been prescribed a CPAP device to treat your sleep apnea, use it. As you are probably well aware by now, sleep apnea causes your breathing to stop and start during sleep, sometimes up to 100+ times per night, because your upper airway closes (is obstructed). Left untreated, you will most likely snore, gasp, or choke while you sleep and the last place you want to experience these symptoms is in a hotel room. Moreover, untreated sleep apnea results in poor sleep quality and daytime fatigue which will seriously impact the quality of your vacation or your performance on a business trip. Last, realize that your body will not enjoy the long-term adverse effects of untreated OSA, i.e., cardiovascular problems, diabetes, high blood pressure, heart attack, stroke, obesity, and death.